Nonprofit needs vary as widely as the areas of community need. Sometimes it’s hard to know where to start. Start here. Nonprofit needs vary as widely as the areas of community need. Sometimes it’s hard to know where to start. Nonprofits in Northeast Ohio excel through engagement and volunteerism. Volunteers make a huge impact in the daily operations of nonprofits and in the lives of everyday people, thanks to BVU's ability to connect an individual's passion and an organization's pressing need. We thoughtfully connect business leaders and nonprofits to foster productive and rewarding leadership and volunteer activities. Access to BVU's high value and proven consulting offerings, including board development, succession planning, executive transitions, and operational consulting. 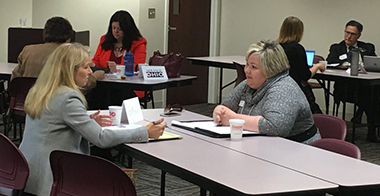 Experts from human resources, technology, finance, marketing, real estate, law and other professions are available to help nonprofits with specific projects. Access teams of business volunteers seeking community engagement opportunities. Are you a nonprofit interested in receiving services from BVU? Please complete this brief questionnaire and someone will be in contact with you.